An overstuffed chair is arguably the most comfortable piece of furniture in the room. So comfortable, in fact, that you tend to use it more often than any other piece. Years of use can make your chair's fabric look worn and tattered. 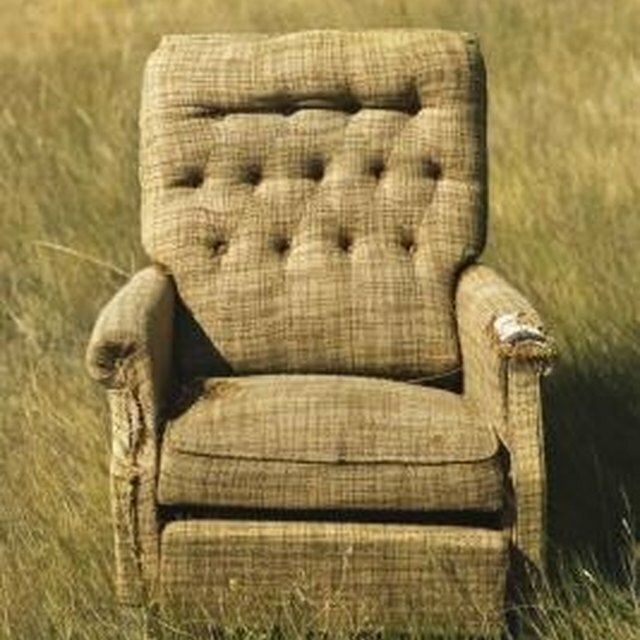 However, just a small investment of time, effort and materials can make your favorite chair look like new again. Revitalize an old chair with minimal investment. Pry off any nails or upholstery tacks with your pliers. Remove the old fabric and batting from your chair without tearing the fabric. Pay close attention to the location of each of the fabric pieces as you remove them. Pin the old pieces of fabric to your new fabric and cut out your replacement pieces exactly the same size as the template originals. Wrap your new quilt batting around the padded areas of your chair and staple in place. Pay close attention to the seat and back sections of the chair to make sure you fill in enough batting. Reattach the new pieces of cloth with the staple gun in the exact reverse order of how you removed the old fabric. Sew welting—or trim—onto your "new" chair as desired. Choose an upholstery fabric that is easy to work with. Suede and leather are very stiff and difficult to manipulate. If a piece does not go on properly with the first try, remove it and try again. It will be much easier to fix immediately than once additional pieces are attached. Residing in northern Georgia, Anna Rose began writing in 1997 and was first published for a scholarship in the local Jackson EMC newsletter. Rose also holds a Master of Science in organizational leadership from Brenau University, as well as a Bachelor of Science in agriculture from the University of Georgia.